Start your day with a hearty Irish breakfast at one of Dublin's many pubs. The traditional Irish breakfast sausage, bacon, blood pudding, fried eggs, and if you're feeling adventurous, a pint of Guinness. Walk your meal off at Dublin's museums. The National Gallery, Museum of Natural History, and Museum of Decorative Arts and History are all within walking distance of each other. Afterwards head to the Guinness Storehouse and learn all about Guinness and Irish culture. Grab lunch at the restaurant inside. Next head to Dublin Castle. Take a tour or visit the inspiring Near Eastern and Islamic art collection at the Chester Beatty Library. Take the bus to Trinity College. Explore the beautiful campus of Ireland's most prestigious university. If you have time, take the tour. When you're finished, head to Grafton Street, which demarcates the western border of Trinity's campus. This is Ireland's premier shopping street. Check out all the unique shops and take care of your souvenirs. Grab dinner at one of the many restaurants along Grafton Street, then wind at Saint Stephen's Green. Enjoy the sunset while exploring this lovely urban park. 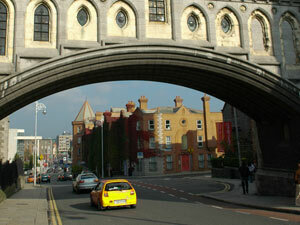 If you're feeling up for it, grab a taxi or bus and head to Temple Bar. This is the heart of Dublin's legendary nightlife. Check out one pub or many to get a taste of how Dubliners relax and have fun.